U.S. Rep. Chellie Pingree, right, and Maine Attorney General Janet Mills, center, try their hands at milking Sunday during the Political Pull event at the Windsor Fair. It’s hard to unseat an incumbent, especially a four term congresswoman. But, at least in terms of milking a cow, candidate Marty Grohman, an independent, did just that during Sunday’s Political Pull at the Windsor Fair. Grohman, who grew up on a Jersey dairy farm in Carthage, filled a pail with about a gallon of milk and handily bested all the opposition, including U.S. Rep. Chellie Pingree, a Democrat, to take home the blue ribbon at the good-spirited, bipartisan gathering. 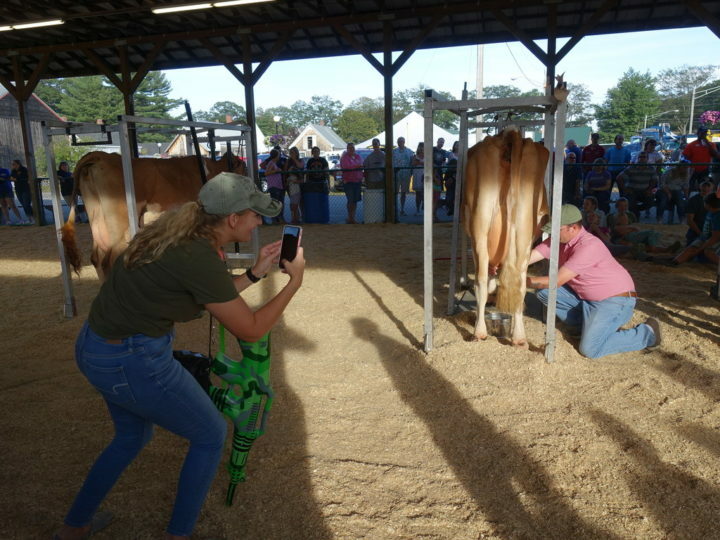 The annual milking contest seemed like an oasis of civility and fun in the tense, fractious political climate prevalent both state and nationwide. If politicians found they could only get ounces of milk out of recalcitrant cows, no damage was done — except to their pride. He was one of about 20 politicians who came to the Political Pull, which is the best turnout ever, organizers said. Although it is a lighthearted event, there is a deeper message, according to Windsor Fair President Tom Foster. “We want to remind our politicians not to forget agriculture,” he said. 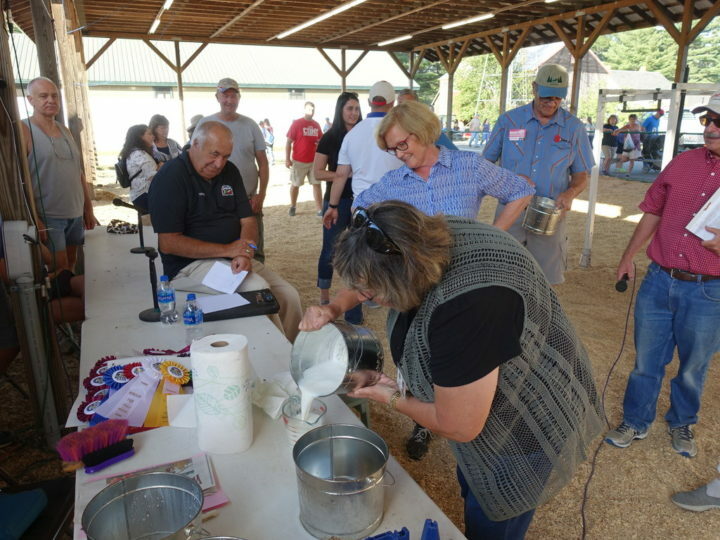 U.S. Rep. Chellie Pingree, D-Maine, watches as Karen Foster measures milk Sunday at the Political Pull event at the Windsor Fair. For Pingree, a former Political Pull blue ribbon winner, agriculture is close to her heart. She has worked as a small, organic farmer and serves now on the House agriculture appropriations subcommittee. Prior to taking her turn next to one of the dairy cows raised by 4H members, though, she tried to downplay her milking experience. 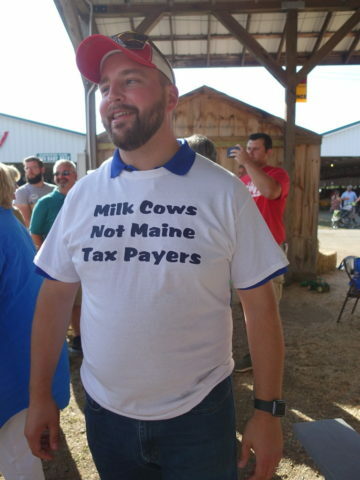 Rep. Matt Pouliot, R-Augusta, who is running for the Maine Senate, purchased his T-shirt Sunday at the Windsor Fair, just before taking part in the Political Pull event. "I found it when I walked in. I said, 'I've got to have this,'" he said. Sen. Dana Dow, R-Waldoboro, who is seeking re-election, runs a furniture store, not a farm, he said. He wasn’t expecting to take home any prizes, but he likes coming to chat and meet people. Mills also stayed modest about her experience and expectations. Grace Fecteau snaps a photo of her husband, Justin Fecteau of Augusta, at the Political Pull event Sunday at the Windsor Fair. "I think this is awesome," she said. Justin Fecteau is a Republican running for Maine House District 86. Master of ceremonies Bill Bridgeo, the city manager of Augusta, kept the politicians laughing as officials slowly tallied up the ounces milked to determine the day’s winners. But in seriousness, he said, other deliberative bodies could take some lessons from the Political Pull.